Today is the day we honor and recognize our nations Veterans. Veterans Day differs from Memorial Day in it is a day to remember and thank ALL those living veterans who served in the military in wartime or peace. Memorial Day is a day when we remember and honor those military personnel who have died in service to their country, particularly in battle. On June 1, 1954 the word “Veterans” replaced “Armistice” to observe all veterans who served in all wars. 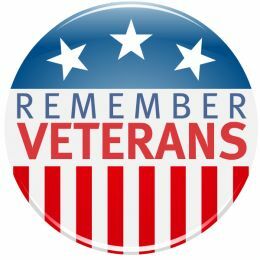 It is a day in which we honor America's veterans for their patriotism, love of country, and willingness to serve and sacrifice for the common good. On this day and every day we are forever thankful for those who have valiantly fought to protect our freedom and the country that we love, the United States of America.